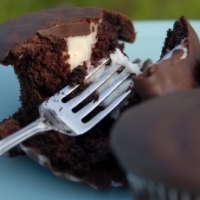 This recipe reminds me of the Hostess Cupcakes only softer and tastier. This recipe was a real find for me. Everyone I have made it for would kill for the recipe. Well here it is and no dead bodies. Place paper liners in two 12-cup muffin pans. Prepare cupcakes by sifting together flour, baking soda, baking powder and salt in bowl. Bring sugar and 1 cup water to boil in saucepan, stirring until sugar dissolves. Pour into large bowl and add chocolate and butter. Let sit, stirring occasionally, until chocolate is melted and mixture has cooled slightly. Stir in vanilla. Using mixer, beat in eggs. Then mix in dry ingredients. Divide the batter evenly between the prepared pans and bake until toothpick inserted in center comes out clean (about 25 minutes). Cool in pans for 25 minutes more. Then transfer to rack to cool completely. Using mixer, cream butter until light and fluffy. Beat in 1/2 cup powdered sugar. Add vanilla and 1 tablespoon heavy cream. Beat in remaining powdered sugar and 2 tablespoons heavy cream in batches, alternating after each addition. Beat in marshmallow creme, then set aside. Prepare ganache by placing chocolate in a stainless steel bowl. Heat cream and 1 tablespoon butter until just boiling, then pour over the chocolate. Let stand for 5 minutes. Whisk until smooth, then add 2 teaspoons vanilla. Let stand until cool, but still glossy and liquid. Spoon filling into pastry bag with medium tip. Insert tip into center of each cupcake top. Fill until the cupcake is heavier, being careful not to overfill. Dip the cupcake tops in the ganache. Meanwhile, prepare icing with mixer. Beat remaining 1 stick butter, 1/4 teaspoon vanilla, milk and powdered sugar until smooth. Spoon into pastry bag with small tip. Pipe onto cupcakes to decorate. These look and sound heavenly! Bookmarked and can't wait to try! Like karlyn255's recipes? Never miss an upload!